Emerson raises the bar in Baar! Services are at the core! Among the highlights of the automation journalist’s year are User Group Meetings and press events organised by the leading vendors in the sector. Read-out has covered many of these and the leading and longest “on-the-go” are those organised by Emerson Process Management in Europe. 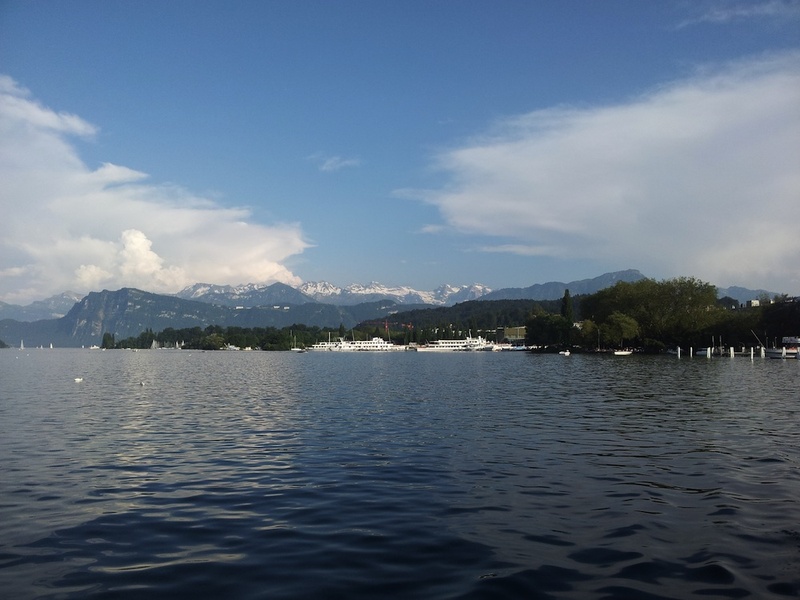 The incomparable beauty of Switzerland – Lake Lucerne a few miles from the new Emerson HQ. This year the journalists headed for the beautiful country of Switzerland, basking in glorious sunshine while the white-topped Alps smiled down on us. As usual in these events the organisation was faultless and journalists and some users from throughout the European region were made feel at home in the short time they were there. There was a sense of sadness too as the H H C Lewis organisation, the public relations firm who did a lot of the planning for this (and for all such events for Emerson Europe), had suffered the sudden loss of Charles Lewis about six months ago. Charles was always in the thick of things at these events making sure that everyone was happy and on-time. His presence among us was sadly missed. May he rest in peace. 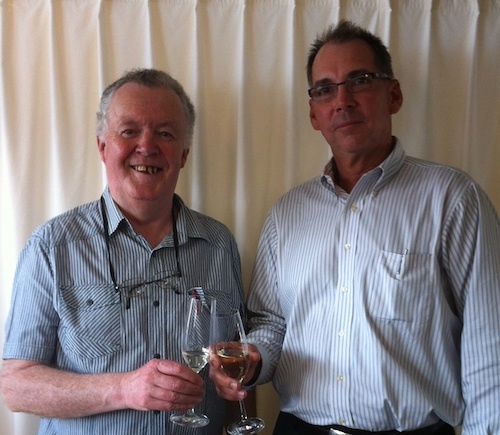 Adrian Chesney’s open and friendly personality was there this time to ensure that everything went swimmingly. This correspondent travelled from the scenic, and also sunny, fastnesses of Conamara, on the west coast of Ireland, into the great alpine fastnesses of that beacon of freedom and democracy in the heart of Europe, the Cantons of Helvetia. 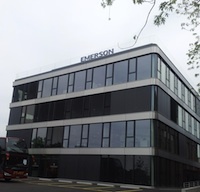 The destination was the scenic town of Zug, close to the new state-of-the-art headquarters of Emerson Process Management at the nearby settlement of Baar. A get together was organised for the first evening on a cruise on nearby Lake Lucerne and old friendships were renewed and new ones created. The press conference itself was a focus on Emerson’s global support service initiative, with a number of Emerson customers describing their experiences. It was also an opportunity to see their new headquarters up close and personal and the conference and presentations were given there. The conference was started by newly appointed Emerson Process Management Europe President, Roel Van Doren, who after welcoming the delegates to the new building made a brief presentation. He outlined Emerson’s strategy philosophy which is based on “solving our customer’s toughest problems!” I suppose it could be summed-up by the image they used throughout the presentations. This emphasised closeness to the customer, knowledge of the industry being served and ease in dealing with each other. He also gave an outline of Emerson’s worldwide presence. 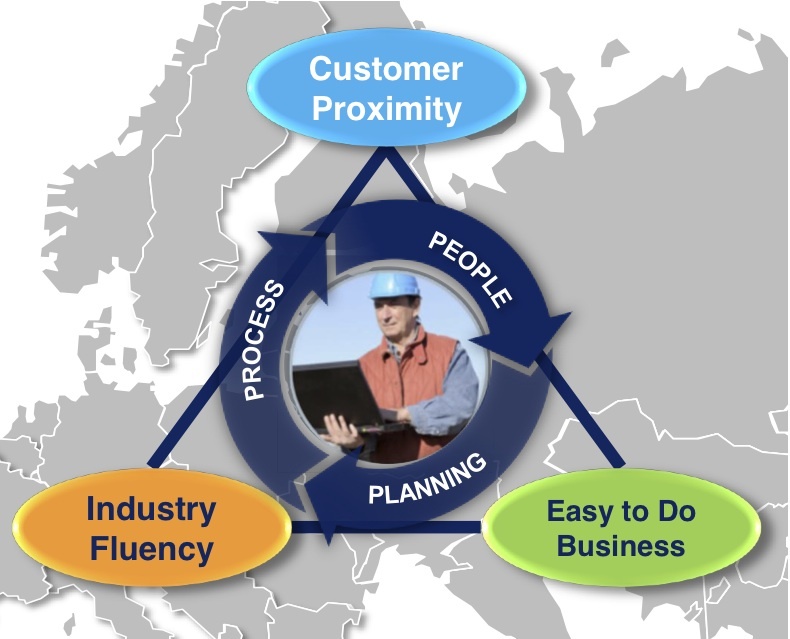 The importance of smart connections for project services was the theme of a presentation by Rolf Hemminga, Director PSS Europe, Plantweb Solutions Group. In a way he said, Products are not important so much as the service we bring!” He was talking about the lifespan of a process plant. It takes one to three years to analyse and plan; a further one to two years to design and engineer; one to three years to execute the project and then a further twenty to sixty years to maintain and optimise. One also has to realise that project needs themselves have changed (and will continue to do so) over the past ten years. Emerson has added over 2,500 project engineers worldwide since 2005 and many of the services they provide did not exist ten years ago (visioning, comprehensive safety, wireless, security etc). Indeed he claimed that Emerson had now more safety personnel than equivalent companies. More about Emerson procect services. More on Emerson’s project support programme! There were then four presentations on complex installations in various locations throughout Europe, from Russia in the east to the Netherlands in the west. The first, given jointly by Károly Oláh of MOL, and Emerson’s Glyn Westlake described how they worked togethor to optimise distillation columns at MOL’s Algyõ plant in Hungary. Not only is MOL, “Hungary’s Oil Company,” but is also one of the largest corporations in central Europe. The point made strongly during this presentation was “This is not Emerson coming, doing a project and leaving, but a series of on-going joint engagements. The results have only been possible by combining the best of both organisations: a)MOL’s Deep process knowledge and continuing focus on getting the best from the process b)Emerson’s experience, knowledge of techniques and appropriate tools.” More details of this project. We are used to experiencing simultaneous translation in Europe though this correspondent usually does not have to use the facilities since he usually understands both languages (Irish & English) being used in such events in Ireland. However on this occasion Denis Ordenov, Lead Engineer in te IT and Communications Department in LUKOIL-Nizhnevolzhskneft, LLC in Astrakhan (Russia) found it easier to present in Russian and a very efficient technical translator helped those of us who had little or no knowledge of that language. This was a different application though also dealing with hydrocarbons but from the point of view of operator training rather than production per sé. Again the emphasis was on the co-operation and sharing of experience and knowledge between the user and the vendor! More details on this project. One of the main themes that came across is the shortage of skilled expertese in the chemical sector. This is true of the automation sector as a whole and indeed we in Read-out are often approached by both users and vendors asking if we know of anybody with appropriate skills to fill vacancies in various enterprises. 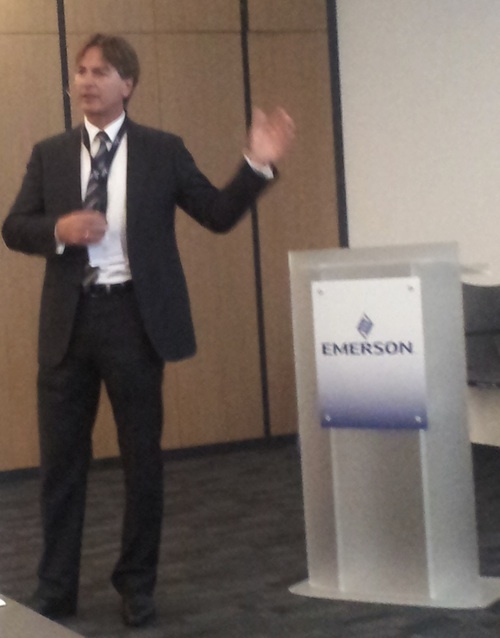 Erik Lapré, Vice President, Service Europe for Emerson, made a short but telling presentation here. There is an urgent need of this expertese, not only in Europe but throughout the world. Emerson are therefore addressing this problem on a worldwide basis. In Europe alone this expanding service is available from 97 locations with nearly 600 personnel – and growing. They try to have these locations close to customer clusters (say the Cork area in Ireland which is an important centre for pharma and food industries) and also provide field support on customer sites. “Services are no longer a fix and repair function!” stated Lapré. Education is important too to leverage the user company’s investment in technology and the bulk of this education is application related. Indeed perhaps this is the key message that Emerson wished to propagate at this event, “..services are at the core of who Emerson is, bringing to bear the best of people and technology, and making smart connections to help customers bridge the gaps.” More on this Service Offering from Emerson. The Croatian company INA needed to upgrade its refineries to meet European fuel standards but found itself lacking in resources. Igor Šepić, Refinery Director Rijeka, stated that their resources, not surprisingly are focussed on maintenance, operations and the occasional small projects. But for the six big projects needed they needed external resources. They evaluated evaluated the major process automation suppliers and felt that Emerson’s DeltaV fitted their circumstances. It was thus preselected for Control & Safety Systems (BPCS & SIS) for all 6 projects. He particularly pointed out the advantages they found. They had a resident Emerson site engineer. For preventive maintenance Emerson’s AMS Asset Management Solutions provides Predictive Diagnostics. “Having installed the most advanced equipment and systems, Emerson technical experts are now helping us maximise performance to ensure the plant becomes established as one of the most efficient facilities of its type.” More on this project. Another area in the oil/gas sector is the storage and terminal area, often overlooked as an automation growth sector. Ton van Dijk, of Vopak made this presentation. The fact that this sector was often overlooked was highlighted when one of the delegates interupted to ask what exactly Vopak did. In fact it is a huge company with 84 terminals in 31 countries. Their co-operation with Emerson, a process he described as “co-creation,” allows them to concentrate on what they are interested in, viz: automation system availability and issue resolution time. They are not interested in hours spent on site or detail. This is the way their partnering is divided allowing them to concentrate on their terminal expertese and opeartional execution while Emerson concentrates on the other aspects essential to the smooth running of the terminal – product availability, implementation capability, QA & testing standards & expertise, engineering know how and ability to execute. The event terminated with a lively question and answer session. A subject that had hardly been touched on during the presentation except in the most general way was cybersecurity. “This is one of those rolling problems which Emerson as an organisation is constantly keeping under review.” To date the malware has been directed originally at specific processes – eg Stuxnet – and then through ignorance or indeed carelessness has spread elsewhere. As access to process control systems, primarily through data acquisition systems, has spread into non-process areas such as IT and/or higher management, care has not always been taken to protect the control systems. Common sense has sometimes been lacking. It is important that strict rules are applied and implemented on who has access, the type of access and the strict control (for instance) of the use of thumb memory sticks. Press Event – Brussels 2011 see also Nick Denbow’s report! This entry was posted on Tuesday, June 25th, 2013 at 2:19 pm and is filed under Marketing, Process Automation, Process Control, Training/Education. You can follow any responses to this entry through the RSS 2.0 feed. You can leave a response, or trackback from your own site. 2 Responses to Emerson raises the bar in Baar! Nice summary post Eoin and thanks for your participation at the event. Glad to meet in person finally and picture to prove it! Eoin, Thanks for the mention in the article. I think I got that idea about things not happening unless there’s a picture from my kids. I’m trying to stay young by thinking like a “Millennial”!